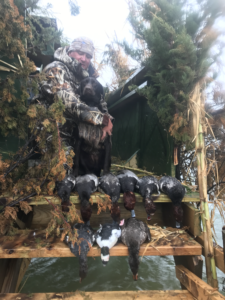 Waterfowl hunting, Hatteras, NC – open water duck hunting at its finest!!! Specializing in world class waterfowl hunting off North Carolina’s famed Outer Banks in the Pamlico Sound along Cape Hatteras. We offer multiple styles and kinds of hunts for duck hunters like you. Hunting options to include Sink Box and Stake blind hunts. Your first choice for a successful Outer Banks duck hunting in the Pamlico Sound. We work in these waters year-round, either fishing or hunting, and have the knowledge of where to be for your duck hunt. 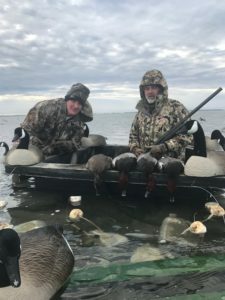 This is the best place along Cape Hatteras for your waterfowl hunt where you will have the opportunity to bag Pintails, Brants, Redheads, Bluebills, Black Ducks, Scoters, Eiders, Buffleheads, Canadian Geese, Canvasbacks, and Widgeons. We offer two styles of hunts for your waterfowl hunt along the Cape Hatteras National Seashore. Here you will experience the best duck hunting on the Pamlico Sound. Sink box hunts are something completely different and unique for North Carolina and specifically to Dare County and the Outer Banks. Many hunters come to duck hunt here on the Pamlico Sound to experience this method of hunting. Fortunately for you, Dare County North Carolina is the last location that permits this type of hunting. It is unique and provides a great opportunity to head home with a full limit. We have constructed a 4′ by 4′ aluminum box that sits under the water. There is a curtain on it that raises and lowers to adjust for the tide levels. We have strategically placed our sink boxes on various shallow water shoals in the Pamlico Sound. They are configured so two people can safely hunt from a sink box together. Many people travel a far distances to hunt our famed Outer Banks just to experience a sink box hunt. The other hunt we offer is a stake blind hunt. We have many stake blinds located over a 30 mile area to use depending on where the ducks are. Our camp blinds are big, spacious and have all the amenities of home. Here we’ll also provide breakfast and coffee. Our blinds are 100% dog friendly with decks and ladders to access them. 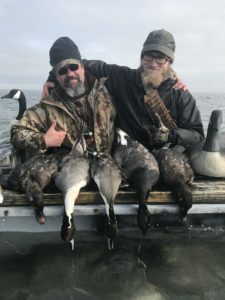 Regardless of which blind you decide to use, hunting waterfowl along the Outer Banks, off Cape Hatteras, is unique compared to other similar hunts you have experienced or been on. You will have an exceptional time being on the hunt. We welcome you to come down and let us be your guides on your next Outer Banks duck hunt. We provide Tanglefree decoys on our hunts. A proven line of decoys that will withstand tangling and ruining a hunt.